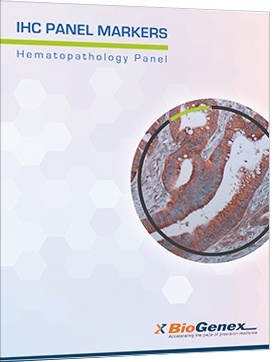 BioGenex hematopathology IHC Panel Markers include specific antibodies useful for the analysis of hematopoietic tissues. The panel is meant to help customer easily find appropriate antibodies for their testing. All BioGenex primary antibodies are quality controlled and tested to provide optimum immunohistochemical staining when used with the appropriate BioGenex detection system. The correct optimization of antibody and detection system minimizes the potential for false negative or false positive staining. This antibody recognizes a human p80 protein, identified as a hybrid of the anaplastic lymphoma kinase (ALK) gene and the nucleophosmin (NPM) gene resulting from the t(2;5)(p23;q35) translocation found in a third of large cell lymphomas. The Bcl-2 is an integral inner mitochondrial membrane protein and is frequently overexpressed in many lymphoid malignancies. Immunohistologic studies have demonstrated that staining for Bcl-2 protein can be used to distinguish neoplastic germinal centers from reactive ones. Anti-Bcl-6 is a transcriptional regulator gene which codes for a 706 amino acid nuclear zinc finger protein. This antibody reacts with Bcl-6 gene product in follicular lymphomas, diffuse large B-cell lymphomas, Burkitt’s lymphomas and in nodular lymphocyte predominant Hodgkin’s disease.